Mouthguards are often used to protect teeth during high contact sports. Sports like rugby, football, boxing, lacrosse, hockey, judo, karate and kick boxing can involve collisions with the chance of damaging a tooth or teeth. Jaw and facial injuries can result in lasting dental problems, which are often highly painful, recurring and expensive to fix. Langmans Dental Health Centres provide custom fitted mouthguards to give you or your children maximum protection. 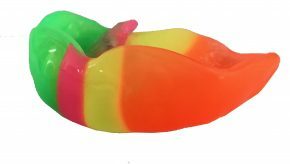 Sports shops do sell off the shelf types of mouthguards that you fit yourself but these do not fit well, are often uncomfortable and will not offer the protection that a custom made one by your dentist can. This is why the British Dental Association, England Hockey and the Rugby Football Union all recommend that only custom fitted mouthguards are worn. Their precise fit covers all areas of the teeth to offer the maximum level of comfort. 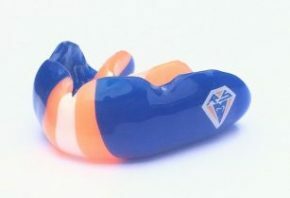 All our mouthguards provide high level impact protection. Their custom fit allows you still to communicate and breathe normally to enhance your sporting experience. They are personalised with players name. They are available in a wide range of colours and patterns. You can choose to match school colours or the colours of your club/sports teams. A custom made mouthguard is a small price to pay to safeguard yours or your children’s smiles. Prices start from just £25.